Circe is a lesser nymph, a god with some similarities to humans. She falls in love with men, and she sings with a human voice. She is immortal, and this makes relationships very different. While she looks young and attractive, she is thousands of years old. Circe spends a lot of time pondering the difference between gods and mortals and she comes up with many differences. Although a god herself, albeit a minor one, she is not a great admirer of the gods, and is more drawn to mortals. She is repelled by the cruelty of the gods, and she takes a defiant attitude towards her father. She doesn't have many great powers, but she learns to make spells using special ingredients and can change the form of people. She makes her first love, a human, immortal, and she turns another minor god into a monster. She insists on honesty when her father refuses to believe someone as insignificant as her could have such powers, and for her breaking of rules, she is condemned to exile on an island. She is alone there for a long stretch, with only the animals for company. During this time, she learns the craft of spells all over again, working by trial and error. She becomes a powerful witch. Eventually she gets visitors, and some of them are well known figures from legend and myth. The best known is Odysseus, on his way back to Penelope, sailing from Troy after being instrumental in defeating the Trojans. They are attracted to each other, and quickly fall into an intimate relationship, and he stays over the winter. But once the spring comes, he moves on, not knowing that he has fathered a son with her. She is fiercely protective of her son, especially since a powerful goddess threatens him, but as he matures, he wants new experience and he insists on leaving the island. So Circe takes extraordinary measures to keep him safe, and this ends up having unintended effects that will permanently change Circe's life. 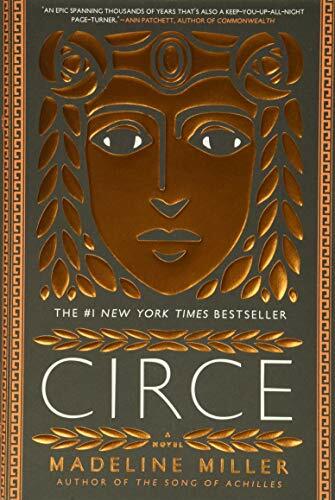 Miller writes very well, making Circe a sympathetic narrator, and making her sometimes erratic actions comprehensible and even admirable. The story moves along at a good pace and there is plenty of action, with extraordinary events but also character development, humor, and some exploration of deep questions of duty and love. Some have described Circe as a feminist work but that's a misleading characterization -- there no campaigning for women's rights here. It simply portrays her as thoughtful and resourceful, reacting to the violence and scheming of men, women and gods. Some reviewers criticize Miller, both in this book and in her previous novel The Song of Achilles, of reducing the great themes of ancient myth to a pedestrian level of romance and adventure novels, or worse. This critical attitude stems from a reverential attitude towards these ancient myths, and a conservative attitude toward these "classics" of civilization. The appeal of Miller's approach is that while she shares great enthusiasm for these old stories, she also gently subverts them, adopting alternative perspectives and exploring different values. We see this in The Song of Achilles where she tells the story from the point of view of Achilles' lover Patroclus, and even more in Circe where she more explicitly calls into question the values and the greatness of those often seen as heroes. It's especially interesting to re-imagine the stories without the traditional female stereotypes about witches and some of the other women in myth whose roles were mostly passive, secondary to their male peers.